In short: speculative short positions, stop-loss at $239, take-profit at $153. According to a report in HT Mint, the Bengaluru-headquartered information technology services provider is assessing the merits of Blockchain, an open-source financial database that records all transactions of virtual currency Bitcoin, to see if the technology could be integrated into Finacle. The move comes at a time when many people are looking at more convenient ways to do banking, such as mobile banking and making transactions using digital currencies like Bitcoin and Ripple. Michael Reh, assigned to revive the fortunes of Finacle, is reported to be assessing Blockchain. Former SAP Labs vice-president (strategy), Sheenam Ohrie, hired by Infosys as the new head of delivery, testing and support of Finacle, and Fuat Bozkurt, formerly with Sopra Banking Software; and Manju H C, earlier with Swiss firm Temenos as banking solutions lead, are assisting Reh. This comes right on the heels of the news that IBM and Samsung are working on blockchain-based solutions. Now, Infosys, with assets just under $20 billion dollars, is another heavyweight reported to be focusing on the possible uses for the Bitcoin technology. This doesn't necessarily mean that the company will actually accept Bitcoin in any way but it might suggest that it will use the ledger system to arrive at new solutions for banking. The recent news of mature companies starting to play with Bitcoin and the underlying technology suggests that players in the tech sector are taking Bitcoin seriously and they are slowly beginning to work possible applications of the ledger systems beyond what is currently available. It will still take years for more companies to follow the trend and to develop products customers will use but it might just as well be the case that the movement has already begun. For now, let's take a look at the charts. (...) Bitcoin slipped back below $250 on Apr. 8 and has stayed below this level since. Actually, on Friday the currency dropped close to $230 and it remained in that range over the weekend. We've already seen depreciation from around $260 to $230. Is it time for a breather? We don't think so. Of course, no market moves in a straight line and there are no sure bets in any conditions but the current picture seems way more bearish than could be inferred from the lack of action below $250. Yes, Bitcoin hasn't moved much below $250, we haven't really seen strong depreciation and the volume levels have been moderate. But these are not signs of a rebound, in our opinion. Bitcoin is below $250, there has been no rebound. Over the last week, the days with the highest volume levels were those when we saw more pronounced declines. Today, we haven't really seen much action (...) but all this fit pretty well with the bearish scenario. Bitcoin looks like it's stopped below the $250 level to consolidate or even more up slightly. A shallow correction to the upside could be seen at this time. On the other hand, the fact that the recent depreciation hasn't really been significant leaves room for even more declines and this is the outcome we would bet on. In other words, if the short-term outlook was bearish on Friday, it is even more so today. Actually, the outlook has been deteriorating for some time now, without a significant move to the downside. This makes the current situation a potential opportunity for a short trade. If Bitcoin continues falling, we might see the currency at $200 (dashed red line in the chart) or even lower. 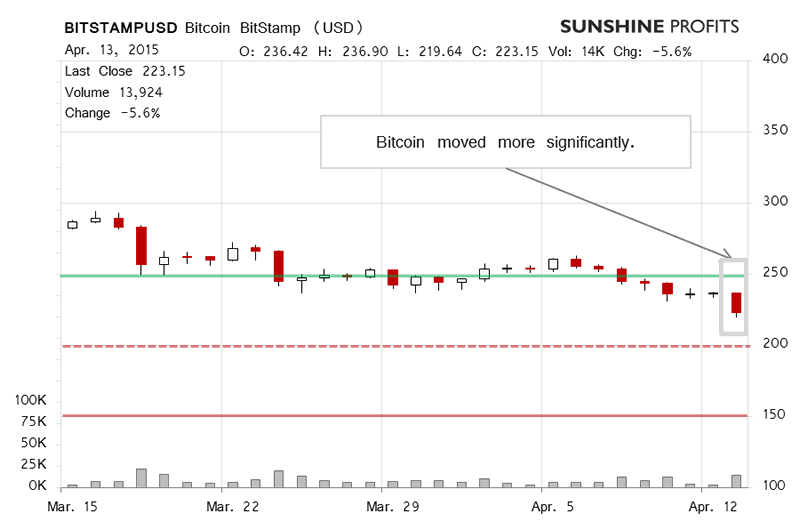 Bitcoin followed lower and today also looks like a continuation of the bearish trend. Bitcoin has depreciated slightly (this is written after 10:00 a.m. ET), almost hitting $215 at one point. The volume is shaping up to end close to what we saw yesterday (the day is not over yet, mind). The most pressing question you might consider based on the already profitable hypothetical short position is whether it's time for a pause or a short bounce to the upside. A move up is definitely possible since Bitcoin has been falling for some time now. On the other hand, we still are not in oversold territory, so there still might be room for declines before a counter-trend move up materializes. We opt to wait and see as in the past significant local tops have only been in after Bitcoin moved to positions more oversold than what we're seeing just now. (...) the current trend sure seems to be to the downside. 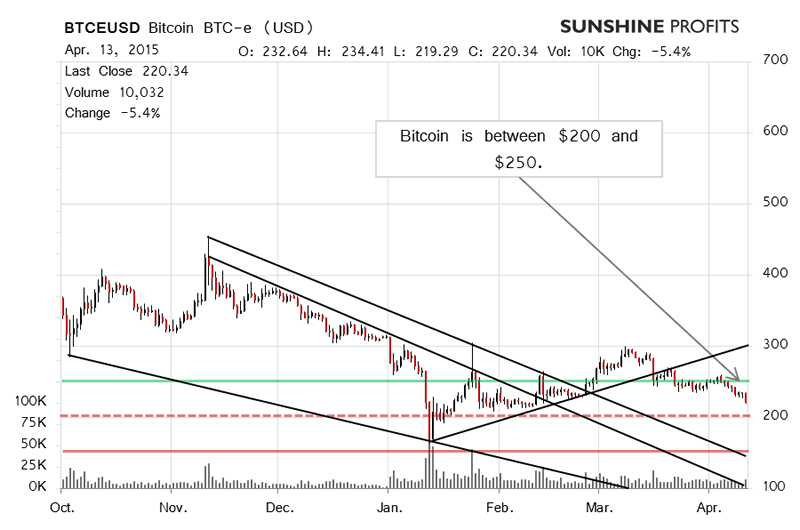 Bitcoin is below both a possible rising trend line and below $250 (green line in the chart). The long-term perspective provides us with even more bearish indications that the short-term one. Also, mind that Bitcoin has been moving lower for just over a week (the most recent move) and the depreciation hasn't been very strong. This still leaves room for the currency to decline. Add that up to the prevailing downtrend and it looks like the previous correction to $300 might be over. In these circumstances, it seems that a bet on Bitcoin going down might be the favorable position. A rebound or a breather is possible, but the current environment indicates that Bitcoin might move lower significantly in the days or weeks to come. The action yesterday and today has confirmed the points we made yesterday, but we would like to focus on the current position at the moment. We first suggested a hypothetical short position on Mar. 20, 2015 when Bitcoin was still above $250 and the daily low stood at $254. Yesterday, when our last alert was published, Bitcoin was in the $230 range and the position was already profitable. Since then this position has become even more profitable and overall the current return on the hypothetical position stands at 14.2% (this doesn't take transaction costs into account). It's not bad for a trade spanning less than one month but we're still inclined to bet on the profits getting even bigger. There are no sure bets in any market and Bitcoin might be getting closer to oversold territory but in our opinion it's not there quite yet. Taking this into account, we leave the hypothetical position untouched allowing the profits to grow, but at the same time we adjust our stop-loss levels to guard the returns. The next couple of days might be even more intense for Bitcoin traders than the last few. Summing up, in our opinion speculative short positions might be the way to go now. Trading position (short-term, our opinion): short, stop-loss at $239, take-profit at $153. All essays, research and information found above represent analyses and opinions of Mike McAra and Sunshine Profits' associates only. As such, it may prove wrong and be a subject to change without notice. Opinions and analyses were based on data available to authors of respective essays at the time of writing. Although the information provided above is based on careful research and sources that are believed to be accurate, Mike McAra and his associates do not guarantee the accuracy or thoroughness of the data or information reported. The opinions published above are neither an offer nor a recommendation to purchase or sell any securities. Mr. McAra is not a Registered Securities Advisor. By reading Mike McAra’s reports you fully agree that he will not be held responsible or liable for any decisions you make regarding any information provided in these reports. Investing, trading and speculation in any financial markets may involve high risk of loss. Mike McAra, Sunshine Profits' employees and affiliates as well as members of their families may have a short or long position in any securities, including those mentioned in any of the reports or essays, and may make additional purchases and/or sales of those securities without notice.